Mo Egeston Music. 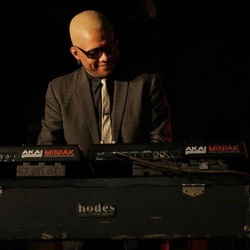 Maurice "Mo" Egeston is a pianist, band leader and educator from St. Louis, Missouri. He spends his musical time leading bands and writing music while also working as a collaborative artist, accompanist and educator in both the classroom and private studio. Mo did his graduate studies in chamber music and accompanying at Southern Illinois University (Edwardsville) with Dr. Linda Perry. He currently runs his own Mo Egeston Piano Studio and is an instructor at Teipen Performing Arts. He has taught adjunct classes in the St. Louis area since 1996 (Applied Piano, Vocal Jazz Combo, Improvisation, Music Appreciation, Music of the United States, Masterpieces of Music). For piano lesson information please click the link. Contact Mo at -moisme1 at gmail dot com- with any questions about band bookings, lessons, accompanying, collaborative, club or studio work. Groove Suites Vol. 1 Mo E All-Stars EP is here! Instrumental soul, nujazz, Latin and funk blended with organic drum and bass, house and downtempo grooves. The dance floor influence can’t be denied- but listening is just fine. Check here for links to all purchasing and listening options or check it out on Bandcamp below. --Mo E trio/Mo E3 Mo E 3 can be anything from a traditional instrumental jazz trio (soul, jazz, pop) to small dance music ensemble. Mo E3 also collaborates with area vocalists including Jessica Butler, Mario Pascal and Coco Rochelle (CocoSoul). Mo Egeston frequently supports with St. Louis based singer and songwriter Coco Rochelle (formerly CocoSoul). Their work together currently includes Coco & Mo and began with the Soul Alliance. And he collaborates with singer Jessica Butler as a duo, trio and full band. See moegeston.com to listen to band samples, watch video and check Mo's performing schedule.